Menchies opened in Edmonton during the summer of 2013 in the Garneau Edmonton area. Menchies is a weighted FroYo place. I know most people think these are pretty expensive, but we find it pretty inexpensive as long as you stay away from some of the really weighted toppings like nuts and gummies. 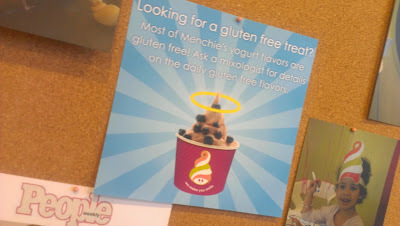 What's really cool about Menchies is that they embrace the gluten free diet and try to accommodate as best as possible. Menchies has advertisements about their gluten free options. They also indicate on each flavour which ones are gluten free and which ones aren't. They also carry dairy free options as well. Sometimes the dairy free options are also gluten free. They usually have two available at a time. Menchies is also OU kosher. Check out all of Menchies available frozen yogurt flavours. Click on the flavours to find out if they are gluten free. We love our FroYo and Edmonton is not short of any FroYo places, but Menchies has become one of our favrouites along with Pinkberry and Twisted Yogurt.